The term ‘psychometric instrument’ can bewilder and confuse: sceptics view them as flaky – just a way to put people in boxes; others worry they’ll reveal intimate details they’d prefer to keep private. We think differently. One of our resident psychologists, Rob Bailey, will guide you step-by-step through the range of instruments available, show you how to choose the right tools, and explain how your business can benefit from their use. If you are new to the world of psychometric assessments and want to find out more sign up now! All of us have experienced conflict at some point, at home, at work, maybe at school or elsewhere – and usually it is seen as a bad thing, something that is disruptive when it comes to the workplace. Yet some people find conflict exciting, energising, something that clears the air. We all have different approaches to conflict, and if we understood these, if we know how we usually react, we can flex our conflict style and achieve better outcomes. And maybe we can help others to do so too. John Hackston, Head of Thought Leadership at OPP, discusses OPP’s research into conflict and introduces the TKI (Thomas Kilmann Conflict Mode Indicator) and shows how it can be used to create positive outcomes from conflict. Around half the population have a preference for Introversion, and yet Introverts are routinely misunderstood, misrepresented and excluded; less than a third of managers are Introverts, for example. In this webcast, John Hackston, Head of Thought Leadership at OPP, will go through the stereotypes about Introverts, explain what Introversion actually is – and show how in neglecting the power of Introversion, organisations are missing out on a valuable resource. He will also reveal how all of us, even Extraverts, have an Introverted side – and how understanding and harnessing this can pay dividends. MBTI and other business psychology practitioners hold a lot of information on their clients, much of it of a sensitive nature addressing issues from performance data to aspects of personality profiles, and therefore are disproportionately affected by the General Data Protection Regulation (GDPR). This will not be a legalistic presentation but practical session with time for Q&A to provide an appreciation of how it could affect our professional lives. Are you self-aware – and if you aren’t, does it matter? In this webcast we will show why self-awareness is important, discuss the benefits of being self-aware, and show how you could increase your self-awareness. Building on OPP’s latest research, we will help you to understand the facets of self-awareness and how these relate to MBTI personality type. Understanding our own personality type and how it differs from others' can be really useful at an individual, team and organisational level. This short video explains how we can develop greater awareness of ourselves and others, and be better at what we do – introducing the MBTI framework. Have you ever wondered why so many organisations around the world embrace the Myers-Briggs Type Indicator® (MBTI) for individual, team and leadership development? In this 30-minute webcast, OPP’s senior consultants will reveal the power of understanding personality difference, exploring the impact it can have on engaging individuals and driving improvements in performance. Suitable for those who have no knowledge of the MBTI tool, as well as those who want to refresh their understanding of the benefits of knowing and applying your personality type at work. Entrepreneurs contribute significantly to the world economy; the new businesses they create can drive innovation and will often result in the formation of new jobs. Yet almost 60% of UK businesses will fail within 5 years. New research from OPP shows the strengths, and possible blind spots, that people of each type will typically have when operating as entrepreneurs. If entrepreneurs and aspiring entrepreneurs are aware of these, it can give them a head start. John Hackston, Head of Thought Leadership at OPP, will present the results of the research, showing how MBTI type relates to your entrepreneurial orientation, and sharing tools for you to work out just how entrepreneurial your own (or your client’s) organisation is. He will also illustrate the likely strengths of each type as an entrepreneur – and things that they should watch out for. Women form half of the UK population, yet less than 10% of executive directors in our top 100 companies are female. 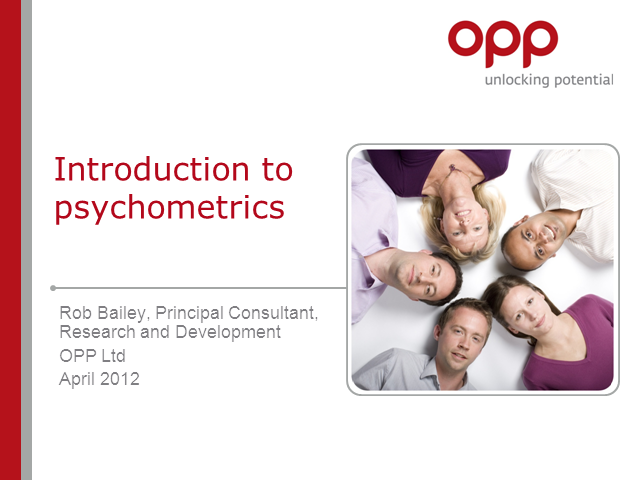 In this webcast, John Hackston, Head of Thought Leadership at OPP, together with Consultant Ceri Boycott, will draw on data from over 600,000 MBTI assessments to show how gender differences in the way we make decisions play a part in creating this imbalance, and how different levels of self-confidence (and over-confidence) between men and women can make things even worse. But it’s not all bad news; they will also show how a knowledge of MBTI Type can help improve the situation both for individuals and for organisations. Coaching is one of the key areas where MBTI insights make a real difference, providing a deep understanding not only of the individual but how they relate to others. This webcast explores how an understanding of the MBTI framework helps individuals resolve challenges they may have in relationships with other individuals. Gil Parsons, Lead Consultant, and Betsy Kendall, COO and Head of Professional Services share a range of ways the MBTI framework decodes relationship issues, including why people who have most MBTI preferences in common may experience difficulties relating to each other. This webcast also showcases some of OPP’s free-to-download images which make deeper levels of MBTI theory easier to utilise in coaching sessions. Coaching on an individual level can impact not only a leader’s performance but also that of their team and the rest of the organisation. In this webcast, Principal Consultant, Katy Lyne explores some real-life examples of where the MBTI framework adds richness and depth to coaching sessions within a large engineering organisation during times of growth and change. Katy looks at practical examples of where MBTI Step I and MBTI Step II have been pivotal during coaching sessions and have impacted leadership and team effectiveness. Worldwide, over 200 billion emails are sent and received every day; sometimes it feels as if we are the recipient of most of them, and many people find email stressful. Building on OPP’s latest MBTI research, John Hackston (OPP’s Head of Research) will take you through how your personality influences the way you use email and how this may affect others, and presents straightforward guidance to help you and your organisation make the best of email. We know that teams are the building blocks that hold organisations together, however even the best teams need help to maintain their effectiveness over time. OPP have been working in partnership with Macmillan for the past two years, in particular working in depth with one team experiencing extensive organisational change. This webcast will include OPP’s approach to team development and how Macmillan are using the MBTI framework to ensure teams work even more effectively together. We will explore in more detail how we used the MBTI instrument to build both individual and team resilience to equip the team with the tools they needed to navigate the changes they were facing. Emotional Intelligence is a concept that has attracted both popularity and criticism in the business world. A major challenge that HR, L&D and consultancy professionals face is demonstrating the effectiveness of what is considered “soft” skills training. Key questions remain: Can emotional intelligence be developed? Should it be trained? What is the impact of developing Emotional Intelligence for individuals, the organisation and customers? In this webcast, join Fiona Ferguson (L&D Manager, Tesco) and Nikhita Dost (Consultant, OPP) as they share insights from implementing and evaluating Emotional Intelligence training for leaders at Tesco. They will discuss links between Emotional Intelligence and MBTI theory, resilience and customer focus. Their findings suggest Emotional Intelligence training may have a wider reach than we think, helping to promote a better customer experience. We can all get stressed from time to time. Sometimes things really boil over, what MBTI users call ‘being in the Grip’, but much more often we just have to manage the everyday stresses of life. In this webinar, Penny Moyle, CEO of OPP, and John Hackston, Head of Research, will take you through how, when we become stressed, an over-reliance on our strengths means that we don’t perform at our best, but how an awareness of our MBTI Type will help us to avoid, survive and master the effects of stress. They will also show you how to use new imagery and resources to explain these concepts to others. You don’t need to be a qualified MBTI Practitioner to participate in this webinar, but it will help if you know your MBTI Type preference. NOTE - There was a sound problem on this webcast so you may want to skip between 14:58 and 17:56. Apologies for the inconvenience. OPP expert psychologists and coaches explore why FIRO and MBTI are the gold standard tool combination for coaching and leadership development. How does FIRO complement MBTI in understanding the complexity and depth of interpersonal relationships? Join us to explore this subject through case studies and present us with your questions. You do not need to know anything about FIRO or to be a qualified MBTI practitioner, but we will assume you are familiar with the four Type preferences. Persuasion – whether we are managers or being managed, parents or children, selling or being sold to, persuading others and being persuaded is something that we all have to do. But of course there is no one single way to influence people. John Hackston, Head of Research at OPP, will draw on recent research and use practical examples to show how the MBTI instrument can help you to understand your influencing style, what sort of approaches will persuade you, and how this might affect your New Year's resolutions. Join MBTI trainer Gil Parsons for some ideas on how you can use your knowledge as an MBTI practitioner in a coaching session to benefit the client and increase your understanding of your own coaching style. Find out about OPP’s new coaching workshops and how they can bring value to your coaching sessions. How does your MBTI Type affect your preferred work environment? John Hackston, head of research and development at OPP Ltd, presents the results of research into the links between personality and the office environment. Find out why current trends could make the modern office a toxic place for Introverts, and how organisations and Type practitioners can help people adapt to the workplace and the workplace adapt to people. Integrating the intercultural perspective with insights from MBTI enables coaches to take account of both nature and nurture in their work with coachees. We will use a case study to illustrate the benefits for this approach; the practicalities of how to incorporate the two assessments in coaching and we will provide highlights research using the two assessments in a large international sample. Betsy Kendall is Chief Operating Officer at OPP, an MBTI expert who oversaw the development and standardisation of MBTI Step I across European languages. She is the author of the European MBTI Step I Manual Supplement and co-author of MBTI and Culture. She is a Chartered Occupational Psychologist and an Associate Fellow of the British Psychological Society. Professor Philippe Rosinski is a world authority in executive coaching, team coaching, and global leadership development. He is the first European to have been designated Master Certified Coach by the International Coach Federation. The Harvard Business School chose his ground-breaking book Coaching Across Cultures as its featured book recommendation in the category of business leadership. His latest book Global Coaching has been described as “having moved the art and science of coaching to a new level. For MBTI Step II practitioners. We have recently created some new approaches to MBTI Step II interventions, making it easier to deliver high impact and memorable team development as well as individual coaching. Our new MBTI Step II Qualifying Programme features a host of new resources, exercises and tips, which are also available to existing MBTI Step II practitioners free of charge, alongside several new products designed to facilitate MBTI Step II work. With the help of case study examples, MBTI experts Penny Moyle and Gil Parsons use their extensive knowledge of the MBTI framework and passion for Step II to explain how Step II practitioners can get the most from these latest innovations. Webcasts to empower individuals to be the best versions of themselves by enriching self-awareness and understanding of others. We help organizations of all sizes improve teamwork and collaboration, develop inspirational leaders, foster diversity and solve their most complex people challenges. We are the Myers-Briggs® Company, one of the world’s largest business psychology providers – the publisher of the Myers-Briggs Type Indicator® (MBTI®) and other leading psychometric tools.